I do have a working ticket with contact@cryengine.com and they are very responsive, but we've had no luck figuring it out yet after a few emails back and forth. Posting here hoping someone else might have seen it or know what's up. Trying to install the launcher from the Download link, and am getting the same error message. Redownload the updated launcher and make sure to turn of your antivirus guard for few minutes to install the setup in administrative privileges.This will solve your problem. 3.Download the launcher in another pc and burn it into cd disk and try on your system by giving run as admin privileges. Sometime the problem will be solved. 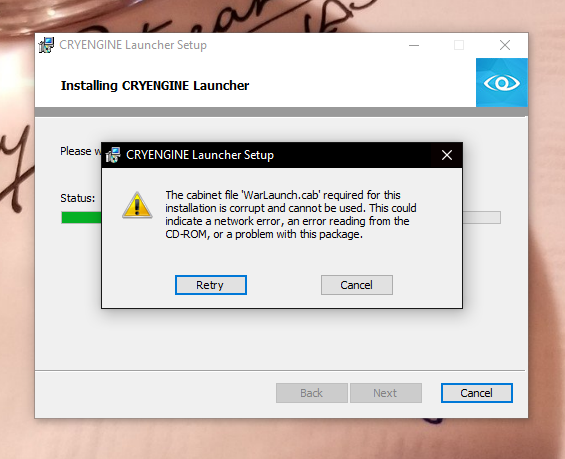 If this doesn't work try to install the launcher in another pc for make sure what is the problem exactly. We noticed an issue with one of our distribution nodes and have since rectified the issue. If you still have this issue please let us know.